SACRAMENTO — The California Department of Fish and Wildlife (DFW) announced on Feb. 11 declining traces of domoic acid allowed the state agency to lift a health advisory for recreational Dungeness crab fisheries south of Pt. Reyes (Latitude 38° 00’ N). Results from recent testing showed low or undetectable traces of domoic acid in Dungeness crabs caught off the coast of Half Moon Bay, Monterey, Point Reyes and San Francisco, according to Karen Smith, a public health officer and director of the state’s Department of Public Health. State officials placed a health advisory on Dungeness and rock crab fisheries along the Central California coast on Dec. 31, 2015, impacting commercial fishers and recreational anglers in Ventura, Santa Barbara and San Luis Obispo counties. 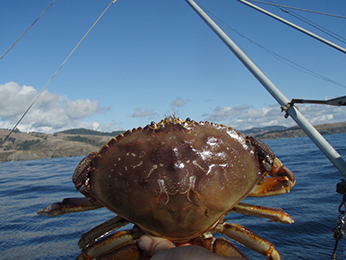 A health advisory for Dungeness crab remains in effect in state waters north of Latitude 38° 00’ N and rock crabs in state waters at Santa Cruz, Santa Rosa, San Miguel Islands and near Piedras Blancas Light Station in San Luis Obispo Counties. Domoic acid levels in crabs found in these areas are still high, according to DFW staff. More information about the health advisory and Dungeness crab fisheries, including what dishes to avoid using crab and best ways to reduce risk, can be found online at cdph.ca.gov/Pages/NR16-007.aspx. The commercial Dungeness crab fishery moratorium still remains in effect, according to news reports.